Program Notes to Accompany "Ononko's Vow"
The dream of Deerfield's colonial experience seems tailor-made for the movies. This was recognized and exploited by the Thomas A. Edison Company in "Ononko's Vow, A Colonial Tale" by Herbert S. Streeter, the early motion picture made largely in Deerfield, filmed "on location" here during early March 1910. Writing of the production March 13th, the Springfield Republican identified both the merits and liabilities of such an undertaking: "History has a strong appeal to motion picture audiences, provided it is selected carefully with a view to leaving out the dry parts and presents the high colors and hair-raising thrills." The particular subject at hand, Deerfield's encounter with the Indians, the Republican recognized as of universal appeal: "Indians with their hatchets, tomahawks, bows and arrows, war paint and feathers are just the people to turn loose upon a picture screen if you would make the audience sit up and give attention." So it has been from the advent of motion pictures to the present TV spectacular. In mid February 1910 the Greenfield newspaper announced the arrival of J. H. White and Frank McGlynn from New York to prepare for the local filming. White, the paper noted, was a pioneer photographer "for this new form of entertainment." McGlynn was "Stage manager", or Director of the production. The pair were soon joined by some 30 actors and technicians from the Bedford Park studios of the Edison company who made their headquarters at the fashionable Hotel Weldon in Greenfield. In all about 55 were involved in the project, including professional actors who took the leading roles and "extras" recruited from Deerfield and Greenfield, a number members of militia Company L. Author of the story was Herbert S. Streeter of Greenfield, proprietor of that town's first motion picture theatre, the Bijou, and promoter of musical and dramatic events. The story is that of the pioneer Smith family whose sire is saved by a friendly Indian chief during the Bloody Brook Massacre of colonial forces at South Deerfield in 1675. The chief, however, is mortally wounded in the encounter and dies at the settlement. Young Ononko swears an oath, promising his dying father to be a faithful friend to the Smiths. Twenty-eight years pass; the lovely daughter of the Smith family, Ruth, is promised in marriage by her father to Ebenezer Dow, this happy event taking place Feb. 29, 1704. That very night an Indian hoard from Canada launches a surprise attack upon Deerfield. Refuge is taken at the dwelling ever after famed as "The Old Indian House"against which the Indians mount a furious assault. Ebenezer Dow volunteers to go for help and escapes death or capture at the hands of the victorious Indians. Ruth Smith, however, is among those taken and marched toward Canada. Ononko, now grown and a celebrated chief, is a member of the relief party summoned by Dow, but arrives too late to save occupants of "The Old Indian House". Learning Ruth is among the captives, Ononko and the others follow their trail. Hostage of cruel Indians, Ruth Smith refuses to obey their commands and is about to be tortured when Ononko appears and demands a chiefs right to exchange places with the prisoner. Himself tied and prepared for death, the colonials arrive just in time to save his life. Ruth and Ebenezer are conducted back to Deerfield by their brave Indian friend who takes his leave as the happy couple return to the settlement. Filming took place within a few days of the 206th anniversary of the 1704 Deerfield raid, its authenticity heightened by a four-foot snowfall. While interior scenes were filmed at the New York studio of the Edison company, outdoor sequences were staged at several Deerfield locations; on the southeasterly slope of Pine Hill, just north of the village and site of the final organization of the original attack; on Deerfield Street itself; and on a hillside of Mount Pocumtuck, east of Memorial Hall. Costumed actors arriving in a large sleigh from Greenfield attracted much attention along the way and between 300 and 400 spectators to the filming. One of the highlights of the production is the appearance of Deerfield's venerable historian, 92-year-old George Sheldon who narrates the story of Ononko's vow for the benefit of a tourist couple who have seen the South Deerfield monument to the Bloody Brook Massacre and solicit information of Mr. Sheldon, shown rocking on the stoop of the Joseph Stebbins House, footage quite evidently not shot at the same time as the other out-of-door scenes. 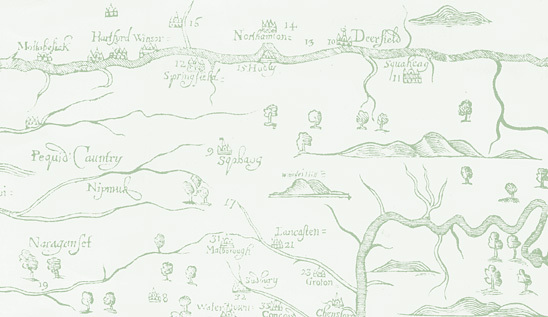 Likewise, the re-enactment of the 1675 Bloody Brook Massacre, filmed at Whately Glen not far from Deerfield itself, was done in another season. Indication is made in newspaper accounts of the March filming that later photography was planned, as seems to have been the case. In recreating the mid-winter attack and sack of Deerfield some attempt at historical accuracy was undertaken by the motion picture company, although realism was not carried to the point of showing anyone being scalped. The Indians "real in the minutest detail of their costumes, with faces heavily coated with paint, cheekbones made high and noses made crooked by means of a putty-like substance" may not entirely satisfy the modern historian, but eminently fulfill the dramatics needs of the plot. Likewise, details of costume, interior and architecture do not meet the standards generally sought by most modern-day film makers. Together with certain production and acting techniques carried over from the stage, especially melodrama, the overall effect today seems rather stilted, even comic, yet was seriously enough considered at the time. The local filming was attended by several unforeseen inconveniences besides the untrodden snow which lay 4 feet deep in and around Deerfield. A crucial battle scene was interrupted by the passage of a railroad train; the tracks and telegraph poles remained out of sight to the cameras, but the afternoon mail train could not be ignored. At another point an over zealous Greenfield "extra" prematurely discharged his blank cartridge dangerously close to the ear of one of the actor-Indians and thus precipitated the action before the photographers were ready to "roll". Two hand-cranked cameras were employed as to the speed at which to make exposures. Director McGlynn shouted instructions through a large megaphone. Every action was planned; each actor being instructed at what point in front of the camera certain of them were to fall dead, fire and struggle. Everything was planned for the most picturesque effect. Professionals were kept well to the front where their every move was emphasized since their actions alone told the story and attention had to be centered upon them. Some nine or ten scenes were filmed in Deerfield, each of about 100 feet of film in length. Portions of the story supposed to take place at an Indian camp in Canada were "shot" at Whately, and total cost of the enterprise was estimated by the press to be in excess of $2,000. Everyone entered into the spirit of the undertaking, even to the point of adding appropriate dialogue to the scenes although no part of it would ever be heard in any showing of the film. The film copy shown in Deerfield was obtained by Henry N. Flynt from the collections of the Museum of Modern Art in New York. It may be a somewhat cur version of the original; no other copy is known to exist. The length surprises most modern viewers, but in 1910 most motion picture productions were far shorter than at present, and "Ononko's Vow" is probably quite representative of most of them.